Do you know that you can play Monopoly: Horse Lovers Edition? Yes, I know. It has blown my mind. 1. 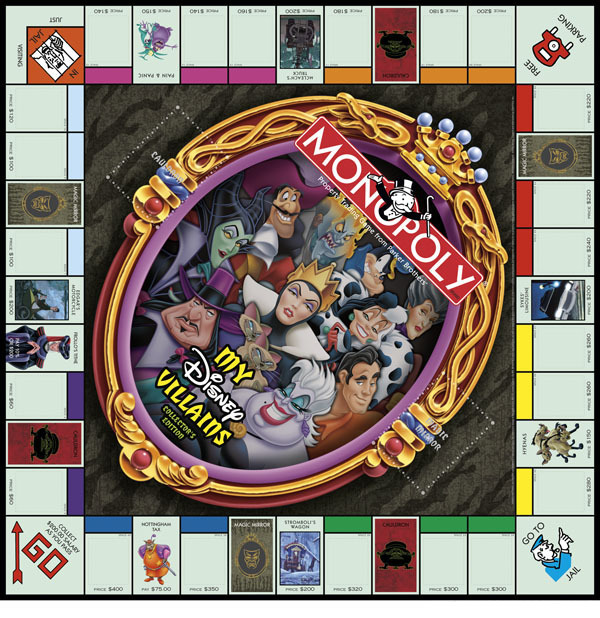 Disney Villains Monopoly (Collector's Edition). This is amazing. The capitalist market system always seems to favour villains, and now you can be one of them! Pay rent to the Big Bad Wolf. Open a shipping business with Captain Hook. Buy some nice coats with Cruella De Vil. Now proving that it is possible to make an edition of Monopoly on absolutely anything. I mean, THIS IS FISHING. Fishing and Monopoly. How can carps check into a hotel? It's like having a Tennis Monopoly, Moderately Difficult Monopoly or "Someone With An Expensive Gym Membership But Doesn't Really Go Often Enough To Make It Financially Worthwhile" Monopoly. 3. The Walking Dead Monopoly. I don't know about you, but if I was being chased by a whole team of zombies whose sole purpose is killing me and feasting on my brain, I wouldn't necessarily be that concerned with being able to get up the property ladder. But hey ho. Actually, I've thought about it some more. The financial market is EXACTLY like The Walking Dead. 4. Monopoly: Horse Lovers Edition. Monopoly. FOR HORSE LOVERS. You probably wouldn't play this game would you? You would just be constantly distracted by all the pictures of absolutely wonderful horses. The notes have horses on them. The board has horse on it. EVEN THE BOX HAS A WONDERFUL PICTURE OF SOME HORSEYS DANCING ACROSS AN OPEN FIELD. 5. MONOPOLY: CAT LOVERS EDITION. !!!! !! ! !! ! ! ! !! ! !!!!!! !!!!!!! !! ! !! !!!!!!!!! !!! 6. Swindon Monopoly. SWINDON MONOPOLY! SWINDON!! Now you can become the banker / landlord dictator of your small local British town, with a convenient setting 40 miles between Bristol and Reading. There's also Jersey Monopoly - probably not one for those who aren't fans of tax havens. But on the plus side everyone who plays is an automatic billionaire. "Lets go crazy, crazy, crazy till we see the sun. I know we've only met but let's pretend it's love. And never, never, never stop for anyone. Tonight let's get some. And live while we're investing in a property market bankrupting your friends and loved ones." 8. Monopoly: Sun Maid (Collector's Edition). PASS GO COLLECT 200 SUNMAIDS. This isn't a game. This is a lunch box. 9. World of Warcraft Monopoly (Collector's Edition). Why does Monopoly and World of Warcraft seem like a really good fit for each other? Well for one thing, both World of Warcraft and Monopoly take about 400 years to complete. Secondly, you always seem to step on small bits causing a considerable amount of pain when you are crossing the living room carpet. That's right! Now you can help build a vast Blackberry mobile phone empire, which then gets beaten by absolutely every other mobile phone empire, and whose phones suddenly stop working for three days before many customers abandon ship. But hey, there's a keyboard! With buttons and everything! "Now you could own this QVC Monopoly Board to enjoy within the comfort of your own home. It comes with everything that you expect from this QVC Monopoly Board - counters, community chest cards and bank notes that you're whole family will enjoy." "But wait there's more. You'll also get this amazing QVC Monopoly board game cover to ensure all of the parts of your QVC Monopoly board stay in one place. Don't delay. Call now."